Just a Place to show my Artistic Endeavors, and maybe pass on some Techniques and Inspiration too! Needing something to work on while waiting for the paint on my elementals to dry and feeling inspired by the blisterpack off of a toy manta ray my kid decided he had to have, I decided to try my hand at making an Aboleth. These guys look like Sad Catfish… I think we can do better. The first thing I did was look up how big the Aboleth was supposed to be. 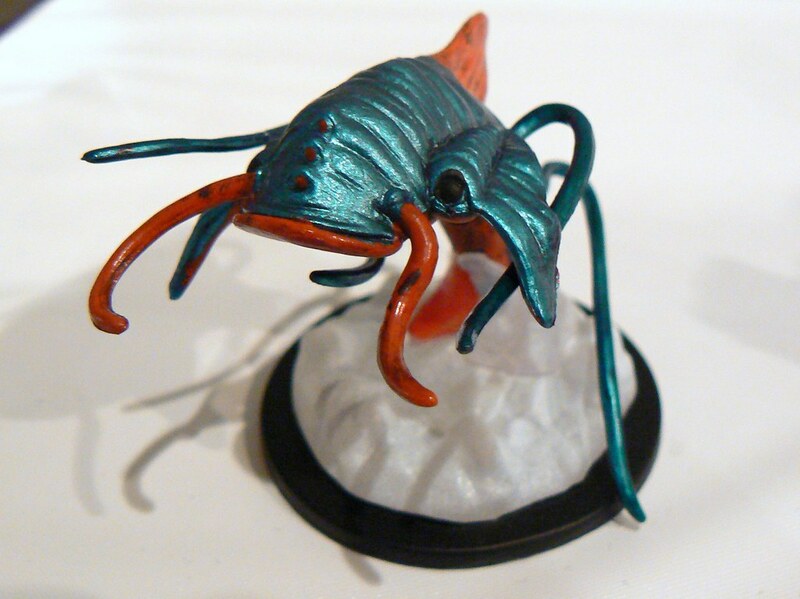 According to my Pathfinder Bestiary I, the Aboleth is a Huge monster, which means a 3″ base. Not wanting to go with a traditional square base, and lacking the ability to cut Foam Core in a circle (the only material I really had on hand), I decided to compromise by making a three inch octagon base. I then drew a rough tear drop shape as I wanted my aboleth to be just below the surface of the water (and thus allowing myself the ability to be lazy and not make a tail! Then I took my Foam Core and made a three inch by three inch square, then I turned it 45 degrees and cut the corners off so the new sides were three inches from each other. And Voila! A Huge Base that can find a home on any water grid (even if I do play Gridless, not everyone does). I then recycled the off cuts to begin making a armature for the body. That done, it was then time to start building up the body. I used some recycled aluminum foil (after it had been washed and dried of course). To give the aboleth some texture, I built up some ridges using strips of manila folder and hot glue. While waiting for the glue to dry, I started making some tentacles using DM Scotty’s method from Episode 62 Part One and Part Two. Then I started working on the base. I used another off cut to lift the aboleth so it would look like it was rising from the deep. I also covered up the edges and built up the sides a bit… though I was a little over zealous with the hot glue and wound up with a base that was 3 1/2 inches instead of 3… oops! I attached my finished tentacles to the base, and used TP to provide some padding. Mostly so I’d have a solid surface to secure the body to. Now my monster needed some eyes. I used the bottoms of water bottles for the lens and hot glue to create bony ridges around said eyes. I also used my hot glue gun to add some detail to the spine and tail ridges. Add another layer of TP and glue (taking care not to cover the lenses and bone ridges of the eyes! ), and once that dried I glued it to it’s base and it was ready for priming. For my paint scheme, I started with a Blue Base Coat followed by a Royal Purple Dry Brush, followed by Bright Green Dry Brush and finally a Sky Blue Dry Brush. Then I coated the whole thing in High Gloss Modge Podge to seal it and make it look wet. ← Bonus Post – More Tiles!